Increased dietary levels of ruminally undegraded protein (RUP) in early lactation has in many instances improved milk yield by dairy cows. 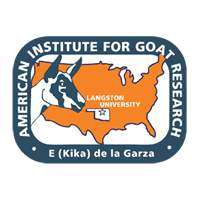 However, in the few studies with goats conducted in this area, added RUP has not enhanced performance. Thus, there is need for experimentation to determine what, if any, experimental conditions are conducive to milk yield responses by dairy goats to added RUP. Hence, a group of Alpine does and doelings were fed diets with 40 or 80% forage in weeks 3 to 19 of lactation. Diets were 18-19% crude protein, with or without added RUP, which was supplied by a mixture of blood, fish, and feather meals that provided two-thirds of the protein from soybean meal in control diets. Milk yield and protein concentration for these doelings and does, which were in low to moderate body condition, were greater with 40 vs 80% forage throughout the 16-week early lactation period. RUP affected milk production only in the first segment, and numerically the response to RUP early in the experiment was greater with 40 vs 80% forage. Over the entire 16-week period, body weight gain was greater with 40 vs 80% forage, and doelings increased in body weight slightly more than did does. Responses to dietary forage and RUP levels were similar between doelings and does. In summary, with low to moderate body condition, moderate dietary concentrate levels may support greater milk production by Alpine goats throughout early lactation, whereas there appears potential for short-term performance benefit from added RUP only very early in the lactation period.